Meet some creatures of the High Desert in our Desertarium. Despite harsh conditions, the High Desert is teeming with life. Lizards, snakes and tortoises are well equipped for the dry climate and sandy soil, and where there’s water, there are turtles, frogs, salamanders and many species of fish. In the Desertarium you’ll get a close-up view of many captivating creatures, including the gila monster, king snake, sagebrush lizard, the rubber boa snake and the endangered desert tortoise. You’ll also find the utterly charming burrowing owls! 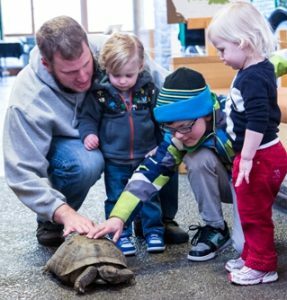 Every day during our High Desert Reptile Encounter, our wildlife staff holds a 20-minute “show-and-tell” where the kids get to gently touch one of the animals and learn more about the skin of a snake, the scales of lizard or the hardened shell of a tortoise. Check the Daily Schedule for more information.